Do you love Chez Geek? Sure, we all do! This expansion deck gives you 55 more cards of Slack and slackers to add to the original award-winning games. More Sleep! More Nookie! More people that you want to get rid of! Slack Attack also includes blank cards so you can customize your deck. Add your own Job, create a Thing, or invent your own Whenever card to stump your roommates. 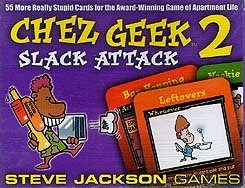 So turn off the TV and put down that mouse - it's time to play Chez Geek 2: Slack Attack! This is not a stand-alone game. Chez Geek is required to play.